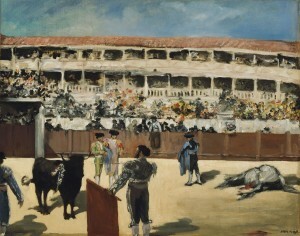 At the Armory Show, Manet was represented by four oil paintings—two portraits, a still life, and a bullfighting scene—but the consensus among critics was that they were “by no means equal to his greatest works.”  Even Frank Jewett Mather, Jr., who lent Manet’s Still Life to the Armory Show, wrote that he was, “adequately but not strikingly represented.”  The diminished impact was likely a result of the works’ placement within the exhibition, dispersed across three galleries. This may have been an attempt by the organizers to demonstrate his widespread influence, illustrating his connection to Impressionism in Gallery O, American “historical” painting in Gallery P, and Post-Impressionism in Gallery R.
 “Ultra Moderns in a Live Art Exhibition at 69th’s Armory,” New York Evening Mail, February 17, 1913, 8. The Chicago lawyer Arthur Jerome Eddy was an early collector of Manet’s work. One of his first purchases was Manet’s Philosopher (1865), a work he bought in 1894, before Manet was well known to many American collectors. Milton Brown, The Story of Armory Show, 2nd ed. (New York: Abbeville Press, 1988), 122-123. Walter Pach, “Manet and Modern American Art,” The Craftsman 17, no. 5 (February 1910): 483. “International Art,” The New York Evening Post, February 20, 1913, 9. Three of the paintings were lent by American collectors, and one by the dealer Stephan Bourgeois. Frank J. Mather, Jr., “Old and New Art,” The Nation 96, no. 2488 (March 6, 1913): 241. Mather later questioned the authenticity of this work. See Frank Trapp, The 1913 Armory Show in Retrospect (Amherst: Amherst College, 1958), 24.